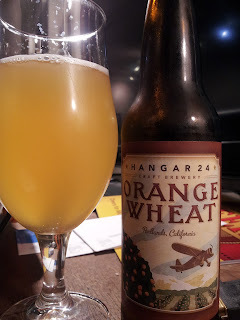 Without a doubt this is the flagship beer from Redland's Hangar 24. If you've ever been to the brewery, you'll have passed through the city and know exactly why this has a wonderful orange essence. Redlands was once a major orange producer in California but the almighty urban sprawl has taken over. Still, Hangar uses oranges from nearby orchards in this light bodied wheat ale. According to our resident Redlands expert, and famed beer snob Brent, the locals love the idea too. I hear they've started a new activist group too: Occupy Orchards! With a nice level of carbonation, and aromas from the wheat and (obviously) the orange, this is exceptionally easy drinking beer. It's tough getting through more than a few of these because of those orange flavors, and the relative lack of complexity, but it's pretty damn delicious. I would say this should the go-to beer during any brunch, as it would fit perfectly next to a mimosa and might convince any friend who "doesn't like beer" that, in fact, they do. Orange tree fun fact: Over watering produces less-sweet fruit!